At the moment that is good enough for fifth position in the Premier League and represents the best start the club has made in the Premier League era. With 10 games in charge it is possible to form an opinion on how the new Head Coach Steve Clarke is progressing at the Hawthorns. Tactically he is more adventurous than his predecessor his default formation is 4-2-3-1 with a lone striker being supported by three attacking midfielders who have license to join the attack because the midfield is anchored by two deep sitting midfielders. However out of possession it is very obvious that the side remains well drilled and you still see Hodgson's two banks of four form up moving in unison across the pitch. lone striker role is probably the most physically demanding on the pitch and being able to bring a fresh pair of legs on after about sixty minutes not only freshens up the side but also protects the main striker (Long in this case) from burn out. Since his appointment in June Clarke has gone about his task with quiet authority although he has yet to be tested in real adversity. The slight downturn of back to back defeats bought a little bit of pressure to do well against Southampton but such are the expectations at the Hawthorns it is hardly a crisis. The start to Clarke's reign has undoubtedly been bright and he has very few detractors amongst the Baggies faithful. The question now is can he sustain it for the next 10 games and beyond? At the start the season I thought that he could guide us to a mid-table finish and I have not changed my view, anything better will be a huge achievement. The fact that we currently sit fifth in the table does not flatter the team across the 10 games there have been no points gained from performances that did not deserve them and it might be argued that we were a little unlucky not to return from Newcastle with at least a point. However and this is something no coach will thank you for mentioning but to maintain the current position and certainly to push beyond it Clarke needs to get lucky. The one piece of luck Clarke needs above all else is for the core of his team to stay injury free particularly when the influential Mulmbu is away on international duty during January. Although he has had to contend with some injury and suspension problems during the opening 10 games he has had the luxury of being able pick a team with a settled spine of Foster, McAuley, Olsson, Mulumbu, Yacob and Morrison who have been virtually ever present thus far.To my mind this is the engine room of Clarke's team and when I see these names on the team sheet I know we will compete and stay in games even if we do not have the ability to dominate play. Whilst I think we can sustain the loss of one of these players we would be greatly diminished by the loss of two of them. 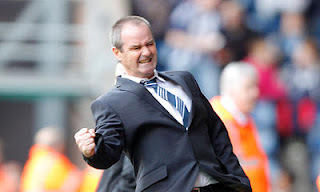 So far so good for Steve Clarke, too many pundits condemned Albion to a relegation struggle on the back of his appointment, to date he has proved his detractors wrong and long may he continue to confound them.